Discussion in 'UFOs, Aliens, Monsters, and the Paranormal' started by Mick West, Mar 9, 2018. As the video starts, the sensor is in infrared “black-hot” mode – black elements in the display are warmer than the dark, or lighter color, areas. It is at zoom factor 1.0. The F/A-18 Super Hornet is at 25,000 feet altitude, 259 knots (~300 mph, Mach 0.61), and in level flight. The sensor is aimed 22 degrees below the horizon and 36 degrees to the left of the F/A-18’s direction. The ATFLIR tracking trap box is a square in the center of the screen. The ocean surface is clearly visible in the background. -26°, 4.4 RNG, 25,000 feet barometer altitude. So assuming those numbers are more or less accurate then it's an object that's around 13,000 feet ((25000 feet) - (1.95 nautical miles)) in altitude, viewed from a jet at 25,000 feet. Basically it's half way between the jet and the ocean surface. The strangeness of the footage is largely a function of the ability of the ATFLIR camera to lock on to a white spot and track it. This accents the visual illusion that the object is moving because the parallax effect. The white dot, whatever it is, would be invisible to the naked eye. It's in NAR mode, which has a FOV of 1.5°. Hence they were ONLY looking at it on the ATFLIR. 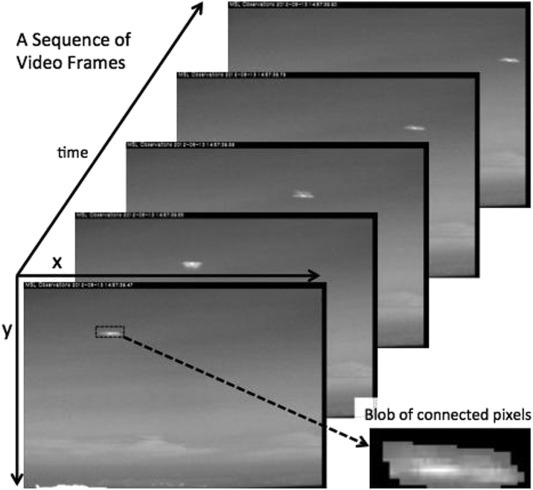 Analysis shows the object does not vary altitude much, and the jet is also flying horizontally, so much of the analysis can be done in an overhead view. This animation shows the effect of varying the turn rate on the calculated speed. The blue line is the simple two point analysis of the target object path with jet (red line) traveling in a straight line. The orange line is the projected target object path with a variety of turn rates from the jet. With this model, the speed of the object could be anything from 28 knots to over 100 knots. This speed is relative to the atmosphere at the level of the jet, and so is consistent with a balloon + wind differential from 13,000 to 25,000 feet. Or a self powered bird. Update Dec 2018 - Great new video of a balloon filmed from a Helicopter showing the parallax effect. The first idea that I would want to explore is whether or not the "go fast" object is actually relatively stationary. During the first few seconds of the video, when the camera appears fixed, the angles are changing. This means that it's not actually fixed, but rather, the camera is panning in order to track a single spot on the ocean. A stationary object, high up, would be expected to appear moving, relative to the ocean. If it is relatively stationary, like a balloon, that would explain why it appears to have no wings or exhaust plume and isn't very hot. The first idea that I would want to explore is whether or not the "go fast" object is actually relatively stationary. During the first few seconds of the video, when the camera appears stationary, the angles are changing. This means that it's not actually stationary, but rather, the camera is panning in order to track a single spot on the ocean. Yes, that's essentially the gist of my post, above. A slow moving bird, and parallax. I thought that a balloon would be more likely than a bird because 12,000 ft seemed rather high for birds to be flying. I was rather surprised to learn that 12,000 ft isn't very high and well within the range of many migratory birds and birds of prey. Created a video showing the parallax effect for a similarly position object on a much smaller scale. Here's the motion of the ocean and of the UFO from 1seconds 22 frames to 3seconds 2 frames. i suspect the initial camera motion might be some kind of default ground tracking. After it locks onto the UFO/Bird this changes. But I think the fact that the motions are parallel indicates they are both derived from the motion of the plane. In fact with a FOV of 1.5° the camera MUST be attempting to track the ground in normal use. If the camera were not continually compensating for the motion of the plane then you would constantly be seeing the background just whizz past. Arguably you could say it's larger, but I think if anything it's smaller, as it's very blurry. 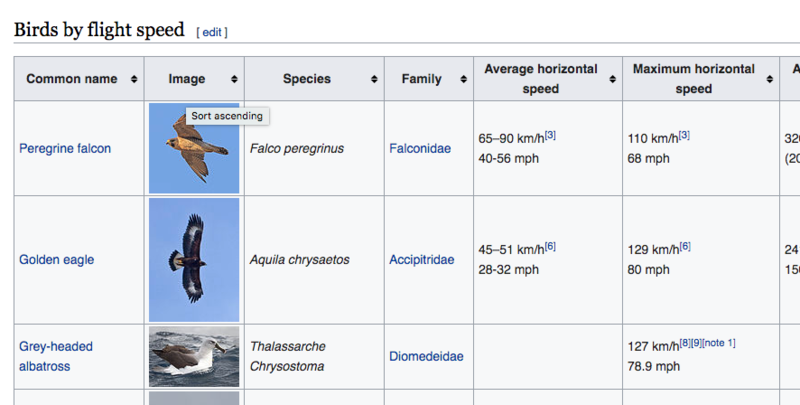 So what birds have a 6 foot wingspan, and can fly at 13,000 feet? (or what other object, like weather balloons). One possibly significant point is that the object appears colder than the water. BLK means black=hot, but it's white. It is (probably) at 13,000 feet. Where the air would probably be colder than the water. Would a well insulated bird still show up as cold (on average). Or does this lean towards a balloon? It would be great o find some video of birds taken from planes. Here's one of a hawk taken from a helicopter. It's probably still moving at a similar speed to the chopper though - still looks weird. The black/white thing is not helping much, unfortunately. A bird against the open sky will most certainly show up 'warm'. 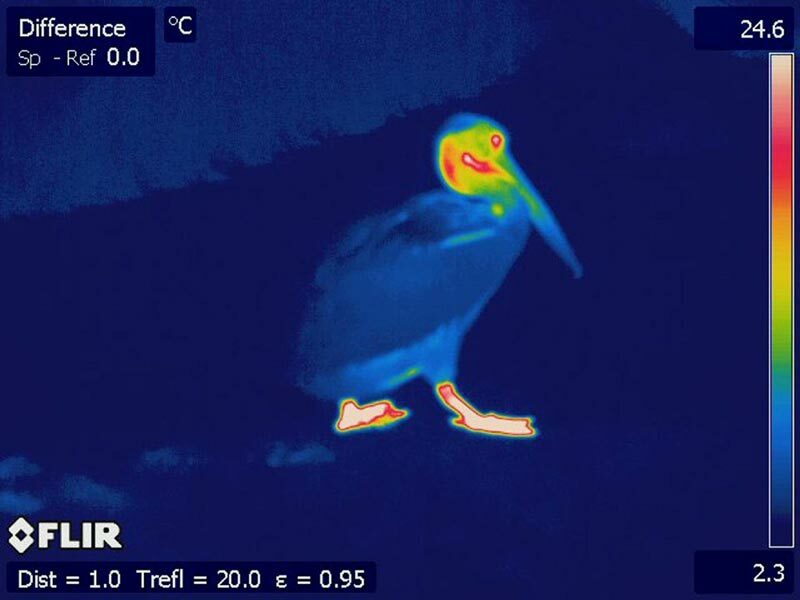 When a warm object, such as an animal, is in the thermal camera's FOV, it appears as a bright blob in the image. However, a water surface reflects sky conditions (with a grade that also depends on the viewing angle of the observer). So it can vary. In one series of images taken the day before the actual day of the experiment, the water exhibits an opposite gradient. The reason for this is apparent from the corresponding optical photograph: we are facing the edge of a cloud front, so the water further away is reflecting the clouds, whereas the water closer to the camera is reflecting open sky. Since the clouds appear warmer than the sky, the result is what seems to be an inverse gradient. Bird feathers are good insulators. When adding the cooling effect of the air flowing around a bird in flight, it's not clear if it will appear 'warm' against a background with possibly variable heat reflection. The pelican has just been sitting on its feet - which is why they are so warm. Its feathers, however, provide excellent insulation and stop heat escaping. A very short FLIR video of a flying bird against sky and ground, from a freely available dataset provided by Oklahoma State University. The appearance of the bird is ambiguous at least. Even against the sky it's not a significantly warm object. It looks to me unremarkably like the cool feathers of a bird flying close over the sea. I also think we can make out a wing-flapping pattern (it sort of 'leaps' forward in steps, a differential rhythmic propulsion indicative of wing-flap-induced propulsion) that reminds me of the flying-insect UFOs called "rods." There are quite a few, but to be more accurate we are going to need to know where the incident happened, obviously its over water, so it rules out certain species such as vultures and buzzards, which are mainly found over land. But birds such as boobies and pelicans tend to be found in more temperate climes, where as others such as certain swans and geese tend to be more northern. The ATFLIR also displays the closure speed (Vc), probably in knots. If the object was stationary, the closure speed at the start of the lock would be approximately 253 x cos(44) x cos(26) = 163 knots, 253 being the speed of the jet and the object being at a horizontal angle of 44 degrees and a vertical angle of 26 degrees. The measured closure speed is a bit higher, approx. 200 knots, which means that the object is travelling towards the jet. If we assume that the object is travelling in the same general direction but at different altitude, the additional 40 knots in closure speed (200 instead of 160) would mean that the object itself has a speed of 40/(cos(44) x cos(26)) = 60 knots (60 nm/hr). This corresponds to 70 mph which is the speed achieved by an albatross. An albatross has a length of about 5 feet and a wingspan of about 7 feet. It seems to me the pilots are more engaged in the fun and excitement of target-acquisition training or challenge than freaking out about a UFO. While a couple times I seem to hear, "What is that thing?" in the mix of voices, there's no overall impression that these guys see the object itself as a serious issue. The issue seems to be 'can you get a lock on that target?' Wah hoo, you did it! If there is a "What is that thing?" stated in there, it's an aside at best. Seconds after the clip cuts a pilot might have answered that question, "It's a bird." And once again we get a 30-second snippet. What else can they do to look like they're trying to trick us?! Ah yes, also fail once again to release chain-of-custody documentation after promising to do so. Just did another demonstration of the parallax motion illusion. A third declassified video, released by 'To the Stars Academy of Arts and Science', a privately owned media and scientific research company to which I’m an adviser, reveals a previously undisclosed Navy encounter that occurred off the East Coast in 2015. Is it possible that America has been technologically leap-frogged by Russia or China? Or, as many people wondered after the videos were first published by the New York Times in December, might they be evidence of some alien civilization? Unfortunately, we have no idea, because we aren’t even seeking answers. Christopher Mellon, as he notes, is part of TTSA. This isn't really news, it's just an opinion piece by a UFO enthusiast. Not just some UFO enthusiast, but one with a stake in TTSA. So instead of having experts debunk this and the previous TTSA videos, WaPo publishes an opinion by one of TTSA's people. "The strangeness of the footage". To me it doesn't even qualify as strange. How is this any different than early-era video games whereby the object stayed motionless and the background moved, creating the illusion of motion? Yes, the object looks like it's zipping across the ocean at super speed, but don't we all - by the age of 5 - have an experience whereby we think we're moving but actually something else is moving? "Everything is relative", didn't somebody famous say that? It does seem very odd that for the long-awaited release of the “Third Video” by TTSA, there was only this OpEd by Mellon in WaPo. Most TSA fans were expecting another mainstream media article like the original NY Times story of last December 16, which was co-authored by Leslie Kean. I was reading a Facebook page discussing the video and debunking Metabunk when someone quoted this passage from the AATIP FB page which I could not access, but I’m sure it’s accurate. “I am getting some of the other background information that 'debunks' West's silly reply. First bit of information... the speed of the object was 300-400 knots (about 350 to 460 miles per hour). As measured by radar.. So goddess help that "bird" should it ever hit the water at such a speed! The wind drag alone would rip off it's feathers! LOL." Can you post links if you are posting quotes. I suspect that this "background information" is just a back-of-a-envelope calculation. But either way I'd be happy to take a look at it. (((Plane at 25000 ft = 4.1 nm Object altitude calculated as: (4.1 nm [height of plane] – (4.1 slant range [plane to object]) x sin 22 = 4.1 – 1.54 = 2.46 below airplane altitude; Height of object = (height of plane – distance below plane ) = 4.1 – 2.5 = 1.6 nm (not close to surface) The sensor is aimed 35 deg left of plane axis and this angle increases to 57 or 58 so at the end so the object was traveling with a velocity component parallel to the track of the airplane. Estimated size of object based on apparent size of black-hot image is approx. (1.5 deg angular width of screen based on narrow FOV) x ([1.5 mm to 2mm diameter of black dot image size on 92 mm wide screen]/[92mm screen width]) x 0.0174 rad/deg x 4.1 nm[slant range] x 6077 ft/nm = 10 to 15 ft!....At 4.1 nm range to the object, the distance across the 1.5 deg FOV is (4.1nm) x [1.5 deg x 0.0174 rad/deg]= 0.1 nm. It crosses the FOV at about a 45 deg angle so the actual approximate distance across the FOV is 0.1 nm/0.707 = 0.14 nm; it crosses in 4 to 3 sec implying a differential speed of the plane and object of 0.14 nm/ ( 4 to 3 sec)/(one hour/ 3600) = 126 to 170 kt)…Since the plane is going at about 250 kt the object was going at the speed approx. (250 – 150) = 100 kt in the same direction as the airplane but clearly slower)"
The problem is that I was on a UFO FB group which needs subscribing to and someone was quoting Gary Nolan from a FB group called AATIP which I cannot find. I’m sure the links will show up somewhere soon. Also not sure if Gary was making a “back of the envelope” calculation or else has access to actual radar tracking data that wasn’t released. Meanwhile I posted Gary Nolan’s quote on Paracast and got this reply from someone who questions how Gary would have access to radar data. So he is claiming they have radar data? That is apparently in conflict with the data that is shown by the instruments of the jet on video. And if they had such radar data, why didn't they track it with the radar then? Since they claim all the background information was removed in the release approval process, why would a consulting geneticist of a private company know something like radar data that is not in the clip? Elizondo isn't supposed to reveal any classified/secret data to anybody, right? I'm calling bs on his claims, for all those reasons. It's moving about 1 degree per second, which at a range of 4 nmi is about 290 mph relative to the sensor, which happens to be moving at about that speed. Nice analysis @Mick West. I've followed your lead and extracted the az/el/rng data from the video which allows you to compute the relative position of the object based on 30 frames per second. This data indicates that the object is traveling toward the camera with a closing speed of about 180 KTS. Subtracting out the camera's forward velocity I get this 3D plot of the position. Red dot indicates initial position. I'm open to suggestions, but this object does not appear to be moving at a great speed. I plotted with red dots each location the flying entity appears in the two opening segments with minimal camera motion. These segments are run at half speed. To me, the paths look consistent with the slightly erratic path of a bird. There's also two points I note where the object seems to slow down, but it's all so blurred and grainy I can't be sure. Notable is that its brightness often dims down to almost invisible. That would seem to be consistent with wing flaps, changing the surface area exposed to the lens. However, when the camera locks onto it later it does not seem to fade out. So there are some notable differences with the before- and after-locked object. When that camera locks on in the rest of the footage you can’t detect any erratic motions or fading of its brightness. When the camera gets locked on, it looks more like a sphere-shaped object. But then IR only shows temperature, not necessarily mass shape. But really?! Putting any extraordinary belief into just another grainy pin-head sized UFO seems foolish. #3 underwhelms! "intelligence officer Luis Elizondo quietly arranged to secure the release of three of the most unusual videos in the Pentagon’s secret vaults." So the three TTSA videos we've examined are the best of the best. Just wow! I thought a balloon is more likely because a bird would appear warmer than the background. Also, I wonder how the WSO detected it in the first place. Did it show up on radar or on FLIR in wide field of view? What value did you use for this? It suggested that Elizondo tricked the Pentagon into releasing the videos, but Leslie Kean told Open Minds UFO Radio that the memo she read didn't have any false pretense, though it may have been a different memo. Elizondo may have said this as well, but I don't remember. The point is to take the WaPo reporting with a grain of salt. That said, it makes sense that Elizondo would want to release the most unusual videos, and it's almost funny how disappointing they were, like literally "It's a bird, it's a plane." Edit: Elizondo did deny any false pretense in a recent interview. But he also said, "We got very clever at dual-using" like putting out requirements that could apply to studying ballistic missiles or "other objects." @Agent K I agree that if these are three of the best videos, it is not very convincing. Nice work @igoddard The apparent change in can also be attributed to camera trajectory. Can you extract the raw data from thos plots? Also, if anyone can extract aircraft attitude from the artificial horizon, I can add that to the simulation above and solve for x, y, z and v of the object. I added the camera position and found an error in the previous plot. Here is the new plot in absolute position from the initial range solution. @Mick West , I used 258 knots level flight. Could do better with attitude assuming coordinated turns. DEG = pi / 180. That number there varies between 252 and 259. The groundspeed depends on the windspeed at 25,000 feet. An additional complication would be how this differers from the airspeed at 13,000 feet. But how does your chart look with an aircraft ground speed of 369 knots? Assuming a simple difference there of 369-258, or 111, that presumably reduces your calculated closing speed to ~69 knots? During the entire period when the ATFLIR is locked on the object, the object’s speed can be estimated on a moment by moment basis. Where V is the airspeed of the F18 in the ATFLIR display, ‘left’ is the angle to the left in the ATFLIR display, and ‘down’ is the vertical angle in the ATFLIR display. Where Vc is the closure speed in the ATFLIR display. In this way I estimated the object’s speed at every second during two periods in the official GO FAST video, one period where the F18 is flying level (1:35-1:39) and one period where the F18 is in a stable banking position to the left (1:43-1:55). Conclusion: The average estimated speed of the object is 80 knots, and it seems to be traveling at a constant speed with a standard deviation over the entire lock-on period of only 7 knots (which could be caused by measuring errors of the sensors involved). See above. The true air speed is 369 knots, you might want to redo your post.